Telex was an international communication system by short printed messages. It was a worldwide network with a numerical address plan with single terminals that sent a message to any other terminal. 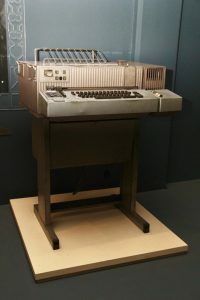 Due to its capacity of immediately receiving the messages and of terminal authentication, this device was used until the end of the twentieth century. The Olivetti Company was created by Camilo Olivetti in Italy on 1908, initially manufacturing typewriters. On the decade of 1920, the company expanded and diversified its operation under the command of Camilo’s son, Adriano, who enhanced the brand identity. The model TE 315 was released on 1977.